The ancestors of the chickens raised for food are jungle fowl (Gallus gallus). These birds can still be found in their native Southeast Asia, where they live in social groups and spend their days foraging for food, caring for their young, and roosting in trees. Their potential life span is 15 years. Domestic chickens forced to produce eggs for human consumption are subjected to a very different, much shorter life. Such unnatural production can only be achieved through manipulation of the birds' bodies, environment, and diet. "Layers" are the most intensely confined of all animals. They are forced to live in tiny cages, stacked one upon the other, in windowless, ammonia-filled sheds, where they are usually mechanically fed and watered. Even in the best of circumstances, 4–5 chickens are crammed into a cage roughly the size of a small cat carrier. The wire mesh of the cages rubs off their feathers, chafes their skin, and causes their feet to become crippled. Broken bones are common among these birds, who suffer significant osteoporosis, reports Michael Gentle of the Roslin Institute (UK).5 A study published in Poultry Science shows that high-production hens' structural bone is compromised because of the need to continually produce eggshells, as well as because normal movement is so severely restricted in battery cages.6 Sick, dying, and dead birds litter the cage floor. Farmers induce greater egg production through "forced molting" — shocking hens' bodies into another egg-laying cycle by starving them for days and keeping them in the dark. It is a stressful situation that causes them to lose feathers and weight. The investigative TV program Kolbotek showed disturbing video footage of this process in egg-production farms in Israel. Under living conditions like this, birds exhibit severe stress-induced behaviors, such as pecking cagemates to death. In an attempt to make the birds calm, farmers control the lighting to keep the vast sheds artificially dim. The ends of their beaks are cut off with a hot blade, without any painkillers. This mutilation causes acute, chronic pain and makes it difficult for them to swallow and eat.7 Farmers claim that debeaking prevents aggressive behavior. Chickens with normal beaks will drop food and peck at the seeds. In the battery cage system, a lot of food is lost through the wire mesh floors, and field studies confirm that the real purpose of debeaking is to preserve maximum profits. At the slaughterhouse, the birds are yanked from their crates and shackled to an overhead conveyer belt. This mechanical system is intended to add efficiency and hygiene in an automatic slaughtering process, which includes the stunning, throat slitting, feather plucking, and disemboweling stages. In practice, however, the chickens are traumatized and struggle as they hang upside down, often breaking their bones. Next, as they are dipped into an electrified bath to stun them, many thrash and bend, missing the stunning process entirely. Then, at the throat-slitting station, a robotic blade slices at their necks while they are fully conscious, and they start bleeding to death. Even the feather plucking process is now motorized, with the carcasses passing between spinning devices with rubber projections that pull out the feathers. Disinfection is attempted by dunking the bodies into chemical baths. The contemporary chicken slaughterhouse is a dis-assembly plant. Some so-called "spent hens" are considered so useless that they're tossed into the trash alive. The Kolbotek televised exposé of conditions on egg-production farms in Israel showed hens buried alive or brutally thrown by one leg or one wing into garbage cans. Workers were shown stomping on the live chickens to squash down the piles so they could add more chickens on top. Eggs are not good additions to any healthy diet. Besides exposing the body to large amounts of harmful substances such as cholesterol and concentrated protein, egg consumption can also cause food poisoning, particularly Salmonella enteritidis, which kills a million people worldwide every year.12 Millions of pounds of antibiotics are fed to chickens, who metabolize only about 20% of the drugs fed to them: the remaining 80% ends up in their feces.13 The waste produced by factory-farmed animals is usually used to fertilize crops and subsequently ends up leaching into waterways — along with the drugs and bacteria that it contains. The severe confinement and filthy conditions in which domestic poultry are raised for human consumption have proved to be a breeding ground for avian flu (H5N1). Birds are being slaughtered by the millions in an attempt to contain the disease. The World Health Organization (WHO) says that so far "human cases of the infection are rare," but it is calling for heightened surveillance as the virus spreads among bird populations.14 Current fears are that avian flu will soon become a human pandemic. Dr. David Nabarro, the newly appointed UN coordinator for avian flu, has said the death toll could be as high as 150 million people around the world,15 although the WHO says from 2 to 7.4 million deaths are a more accurate estimate. There are only two drugs that work against pandemic flu strains, oseltamivir (Tamiflu) and zanamivir (Relenza); neither is widely available, and both are expensive. The Food and Agricultural Organization of the UN (FAO) and the World Animal Organization (OIE), along with the WHO, have launched a control program for this highly pathogenic influenza. In March 2006, avian flu reached Israel. The virus quickly spread among the chickens, turkeys, geese, and ducks on numerous farms. To contain the disease, the government destroyed 1.2 million birds, only a small percentage of whom were actually infected. The primary method used was poisoning the birds' drinking water, which killed them painfully, and then burying them in mass graves. In some locations, the birds were simply buried alive. Later in 2006 and in early 2007, hundreds of thousands of chickens in Israel were infected with Exotic Newcastle disease, a fatal viral infection that affects only birds, and they too were destroyed. The battery cage system of chicken rearing, also adapted for raising rabbits, demonstrates humankind's callous exploitation. It is among the very worst practices in animal agriculture, along with wooden veal body crates, metal pig gestation cages, cement alligator pits, and metal tube force-feeding of ducks and geese. An example of the massive scale of egg and chicken production in Israel is the Glicksman farm in Kfar Meishar, with 260,000 chickens captive in 2 enormous sheds (Ha'aretz, 2005). Since 1968, the Council of Europe (CoE) has been developing non-binding conventions covering animal welfare that apply to battery cages, stocking density, nutrition, hygiene, mutilation, environmental conditions and handling, international transport, slaughter, and labeling. If a nation separately ratifies a convention, it is transposed into that country's law. Since 1978, the European Union (EU) has approved certain CoE directives that have become legally binding for all members of the EU. 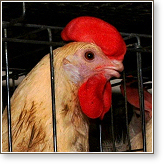 By 1996, specific provisions defining minimum standards for battery cages were established. A new directive in 1999 expanded on the existing law with the goal to phase out traditional unenriched battery cages by 2012. Independently, some European member states have developed legislation that goes beyond the provisions of the CoE and the EU. In some cases, the aim is to increase the space allowance considerably (Denmark, Switzerland). In other cases, in response to public demand, the goal is to ban keeping laying hens in cages entirely (Austria, Sweden). In North America, with a trend toward deregulation, poultry is specifically excluded from any protection (over 6.5 billion animals annually in the US alone). Campaigns against multi-national fast food outlets like McDonalds and Burger King have gained promises from them to consider the welfare of chickens, but all that these improvements amount to is a slightly larger confinement cage. The cages are still arranged in tiers with waste falling on the chickens below and with still not enough room for a chicken to flap her wing or even turn around. And, on her last day alive, the hen will find no change to the factory-method slaughter process — neither a vestige of mercy nor a shred of compassion. 1 Zeev Klein, "Average Israeli consumes 3,545 Calories Daily," Globes—Israel's Business Arena, 14 Oct. 2004. 2 "Iran: National Per Capita Egg Consumption Statistics," Global News Wire—Asia Africa Intelligence Wire, 20 Dec. 2004. 3 Food and Agriculture Organization of the UN, "Eggs Primary Laying (1000)," FAOSTAT database, 2004. 4 U.S. Department of Agriculture, "International Egg and Poultry Review," Agricultural Marketing Service, 18 May 1999. 5 M. Gentle, "Comparative Vertebrate Nociception and Pain," (article included in: A Cross-Species Approach to Pain and Analgesia, J.W. Ludders, et al), International Veterinary Information Service, Ithaca, N.Y., 2002. 6 T.G. Knowles and L.J. Wilkins, "The Problem of Broken Bones During the Handling of Laying Hens—A Review," Poultry Science, 77 (1998): 1798-1802. 8 Ryan A. Meunier and Dr. Mickey A. Latour, "Commercial Egg Production and Processing," Perdue University, 2005. 9 Amy Ellis Nutt, "In Soil, Water, Food, Air," Star-Ledger, 8 Dec. 2003. 11 David J. Wolfson, Beyond the Law (Farm Sanctuary, 1999). 12 "Secrets of Successful Pathogen Revealed, Salmonella," Institute of Food Research, 24 Aug. 2005. 13 Joy A. Mench and Paul B. Siegel, "Poultry," South Dakota State University, College of Agriculture and Biological Sciences, 11 Jul. 2001. 14 "Geographical Spread of H5N1 Avian Influenza in Birds-Update 28," World Health Organization, 18 Aug. 2005. 15 "New UN Pandemic Czar Warns Flu Could Alter World," Canadian Press (CP), Toronto, Canada, Oct. 3, 2005. 16 Karen Davis, "An Open Letter to Vegan Voice," United Poultry Concerns, Dec. 26, 2001.